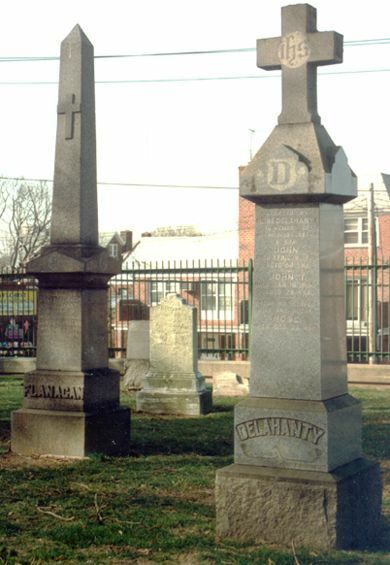 Two gravestones in the DELAHANTY plot at Mt. St. Mary's, Flushing. These are in Division 1, section 4, which was once referred to as "Black Stump Cemetery". This should not to be confused with nearby Brinkerhoff Cemetery, a private family burial ground also known as "Black Stump". Many of the early Delahanty burials were logged into the Long Island City death registers at "Black Stump"
The stone on the left marks the burial place of James FLANAGAN Second child of Andrew and Sarah, (b. Jan 19, 1835, Brooklyn, d. May 23, 1891, Astoria.) 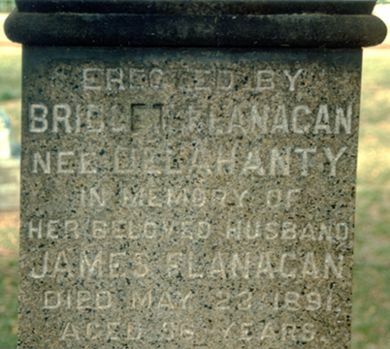 It was erected by his wife Bridget DELAHANTY, (b. ca. 1830, Thurloss (Thurles?) Tipperary, d. 1907, Astoria). Although her name was not added to the inscription, Bridget was buried here Mar 10, 1907. The stone on the right marks the burial site of John DELAHANTY, Bridget's youngest brother. It was erected by his wife, nee Rose LAWLOR, who was also the aunt of Peter FLANAGAN's wife. Photos by Kevin Delahanty, a descendant of Bridget's brother Denis.